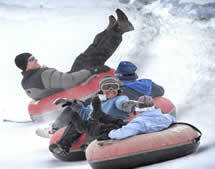 Snow tubing is fun for kids of all ages! And it’s one of the easiest ways to have fun during winter. No uncomfortable boots, no lessons…just take a quick surface lift to the top, have a thrilling ride down – repeat! 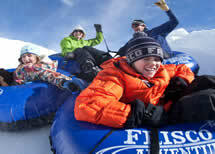 The Frisco Adventure Park tubing hill is a great place for kids to be kids and adults to be kids again! The hill features lengthy 1200-foot tubing lanes with lift service up the hill for tubing day or night under the lights. With our evening hours of operation, you can enjoy an hour of tubing, have an adventure after a day of skiing, spend a full afternoon enjoying a beginner ski or snowboard lesson with an hour of tubing, or bring the whole family for a custom adventure! You’ve tried the rest, now try the best! Since 1997 Copper Mountain’s Tubing Hill has been thrilling Summit County residents and visitors as the county’s original Tubing venue. After a day on the slopes, kick off those ski boots and gather the whole family for a great time! Head to the East Village, sign your waivers, hand-pick the perfect tube, and head to The Stinger Surface Lift. It’s all downhill from there!